Foursquare's brand book, a missed opportunity to prove they're all about making the real world easier to use » Acts, not ads. I love Foursquare‘s purpose “make the real world easier to use”. It’s a plea and commitment to use technology to help people bring more fun and efficiency in their daily habit. A brilliant purpose that inspires me to join their cause, gives me new ideas to add and gives plenty of opportunity to develop new services in the future. So, when they recently launched their brand book, I could not wait to see it. In no way, they are proving their purpose. In no way, this is igniting excitement. In no way, this is inspiring or worth sharing. In no way does it give me new ideas or does it show opportunity to develop new services in the future. I understand it’s important to set the brand guidelines. But why so serious? Dogma is simply “for dogs” and has quite a strong copy and visual style to prove it “And if there were an international holiday for dogs / On which all dogs were universally recognized / For the quality of their contribution to our lives, / We’d be for that too. / Because we’re for dogs. / Everything that we do, we do for the love of dogs”. The 25 things about Boondoggle Amsterdam is another simple yet effective way to provide both guidelines and best practices for a brand. In this case the Amsterdam-based advertising agency Boondoggle. Lines like “Never mistake having fun with not being serious. We’re bloody fanatic about work, we just need to compensate a lot for that” are pretty clear indicators for a remarkable company culture. Bagels & Beans has a set of remarkable house rules, that has a place in every of it’s venues. My favorite rule must be “It’s ok to bring your own food like hamburgers, fries and icecream, so we can serve something healthy with it”. Visual style and copy give plenty of opportunity to come up with new ideas and copy lines. 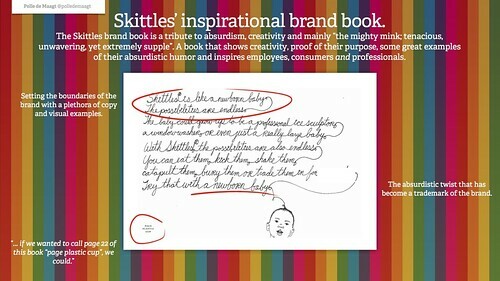 And maybe, one of the best examples, the Skittles Brand Book. More than 40 pages of visual and copy inspiration. Gimmicks, jokes, best practices and ideas to build upon. Ah yes, and a tribute to the mighty mink; tenacious, unwavering, yet extremely supple. Did I already mention the word ‘absurdism’? Back to Foursquare. Make the real world easier to use. Such a great purpose deserves a better brand book, a better way to engage consumers and professionals.